This video is another lecture & demonstration about Turkish traditional archery in one of the universities in Istanbul. 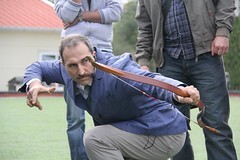 Dr. Murat Ozveri made a speech about the meaning of bow and other archery tackle as hunting tool, as weapon of war, as political as well as military symbols in medieval Turkish world, as a holy object from a mystic/esoteric point of view; of which influence on modern life and language can still be detected and traced. He spoke also about the military and sportive aspects of archery, how the Turkish style of shooting provided advantageous in battlefields. After the lecture he made a live demostration in the soccer field of university campus. In this video a part of this demo is included with English subtitle.